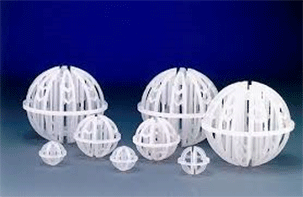 Hollow, spherical packings made of injection molded plastic, available in four diameters: 1”, 11/4 ”, 2” and 31/2 ”. Symmetrical geometry made from a unique network of ribs, struts, and drip rods. • High active surface areas. Extremely high operating capacities. Benefits • High mass and heat transfer rates. Resist nesting, making removal easy. 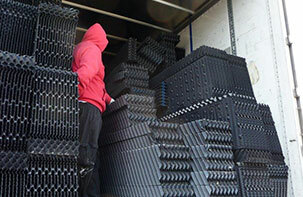 Installs to packed position – no settling. Available in a wide variety of plastics. WSC uses surface fill media designed and engineered to distribute water evenly over the entire fill area for high thermal performance. 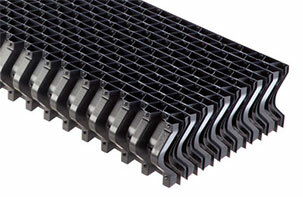 Integrated inlet louvers and drift eliminators complete this efficient high-performance crossflow media system. Superior air and water management for high thermal performance. Engineered herringbone surface for even water distribution. Offset glue bosses space the sheets and form a pack that is strong enough to be stacked one on top of the other in towers with fill heights over 10 feet . Interlocking alignment tabs allow perfect pack to pack registration providing a uniform and seamless installation. Beveled drainage tip design reduces pressure drop by up to 25% (based on air velocity of 800fpm [4.1m/s]) over non-beveled design. Patented Mechanical Assembly (MA) technology for environmentally friendly, glue-free packs. Strong enough to span 6 feet, requiring a small number of support beams and reducing air blockage. Can be field-cut for a tight fit around columns and other structures without sacrificing structural integrity (Dri-Seals are recommended for maximum performance). Nests with adjacent modules to provide seamless drift removal by eliminating gaps between packs that can allow drift droplet bypass. Drift loss of 0.0005% circulating water flow (Test Method CTI-HBIK Standard 140; with proper installation and use of Dri-Seals). Material meets CTI Standard 136.